In January 2006, when the 29-year old Blake MyCoskie vacationed in Argentina, he discovered the “alpargatas,” a canvas shoe worn by Argentine farmers. He also noticed the extreme poverty and lack of shoes (particularly for children). Inspired, he reminisced on this inspiration in a 2011 article for The Business Insider saying “….the intense pockets of poverty just outside the bustling capital. It dramatically heightened my awareness. Yes, I knew somewhere in the back of my mind that poor children around the world often went barefoot, but now, for the first time, I saw the real effects of being shoeless: the blisters, the sores, the infections.” Blake hit upon a business plan for a new company, Tom’s Shoes, which would bring the alpargatas to the world market with the promise that for every pair of shoes sold, a pair would be given to disadvantaged children. The first shoes were sold in May, 2006. On August 20, 2014, Bain Capital acquired half the company in a transaction that valued the company at over $600 Million. What Blake has done for his customers is to awaken the hero within. Whatever your product or service, your marketing process goes into hyper-drive when it has a hero story behind it. You know the hero feeling – that tingling inside you that you only feel when you know you are doing exactly the right thing – the thing you were born to do and do better than anyone else – and you are rising to a challenge on behalf of others instead of yourself. Imagine how Tom Brady or Steph Curry feel when they enter the arena to compete for their team, for their city, for their sport. Think Steve Jobs or Bill Gates announcing a new revolutionary product that will benefit all mankind. A business that can inspire that feeling (for the owners and employees, as well as the customers) has unlimited potential. Do you want this type of inspiration supercharging your life and your business? Invoking this feeling is done with what I call a Metastory. What are the qualities of a good metastory for you? Grand Mythological Back Story. Stories from mythology never really happened. But they are true, nevertheless, and often more true than the truth. They are true on the cosmological level of pure truth. There is an ordinary person, there is a conflict, there is a tragic flaw that must be overcome, first there’s denial, then surrender, then suffering, the suffering gets worse, and finally the hero takes up the call…..and you know the rest. Rescue the girl, kill the bad guy, save the world. Ties into your personal History. Make an inventory of your past. Look at your parents, your siblings, your childhood experiences, and find the natural series of plot points that tossed you around but eventually lead you to what you are doing now. Complements your professional activity. The story must have themes from outside your profession but that draw easy comparisons and metaphors. For example, the dentist who builds miniature sculptures or the attorney who volunteers helping veterans access their benefits. Your story must be something you can “do” and you can document with actions, pictures, videos, and it must invite participation. It must be something you already like to do, so you will persist and have passion. It’s best if it’s something you already spend money on it so that these expenses become tax-deductible. It’s even better if you can enroll supporters in your cause. Has Broad Appeal. 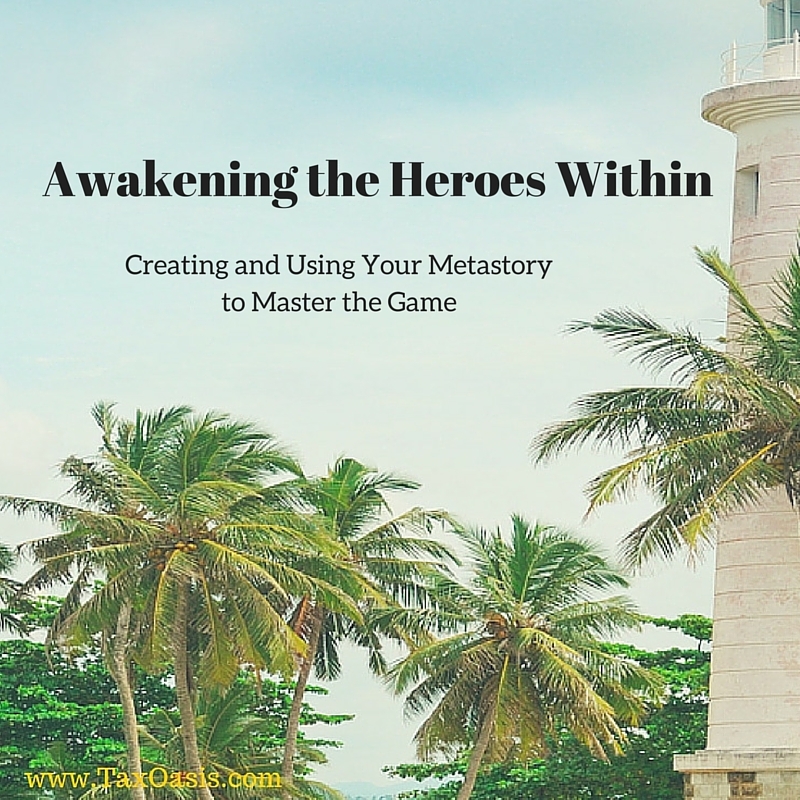 Your story must appeal to a broad range of people who seek a hero. Suits your Time and Your Era. Be trendy. Tie into local cultural memes. Veterans Benefits are a hot item now. Hippie memorabilia is not. Distinguishes you from All Your Peers. Steven Subotnick is a very successful foot surgeon. His book, “The Running Foot Doctor,” established him as more than just a podiatrist, he was the expert in foot care for the runner (very broad appeal) because he was a runner himself. His involvement in homeopathy (trendy) also set him apart from other surgeons as one who would not go to the knife before less invasive treatments were tried. In my rehab, Arnica didn’t work for me, so he recommended and performed surgery. Your metastory should enable you to create a richly-embroidered tapestry out of a variety of content, from activities to metaphors to office decor. Now that you know the basics of a metastory, use them! Build your business around them. Enroll your friends and family. Re-design your branding around it. Take action regularly to advance your story and add content. Co-ordinate your actions with complementary organizations (Co-branding). Make a list of the most important personality traits that set your hero apart from the ordinary – courage, persistence, compassion, wisdom, mastery, etc. Keep that list with you and whenever you are feeling discouraged or are tempted to perform at less than 100%, take out the list and read it. Visualize yourself as the hero you are. You will find your second wind and maintain your excellence. After all, you are the hero. Ordinary people can act when the going is easy. When the going gets tough, that’s when the hero is needed. A real hero put’s his own feelings aside and acts in the best possible way to advance the cause. So you haven’t got time for resentment or self-indulgence. When you are about to meet with a difficult person, forgive that person in advance for all the rude things they might say. This will aid you in responding in the most effective way to get to the best outcome, instead of reacting emotionally in the moment. Make the assumption that the other person has a positive intent and is not wrong, but rather that they know something that you don’t know, which makes them act in a way you don’t yet understand. Then try to find out what that something is. Give up on being right. Humbly take the blame even when you don’t deserve it. Validate your clients and customers’ ideas, even if they appear misguided. People are not used to being treated this way and they will feel a connection with you. Now, as your tax advisor, I’ll give you some professional tax coaching about how to weave your metastory into your business plan to make sure that all your fun is ALL TAX DEDUCTIBLE. Get to know the tax game (and it IS a game). A game is an activity with a goal toward which play is directed. When you know the rules of the game, you can masterfully bend them to your will, set and attain ambitious goals, and make the process playful. For example, travel is either deductible or not based on clear rules outlined in IRS Publication 463. Do you know the rules? Use ‘em! Learn how to “spin.” Deductibility is primarily determined by your intent (spin). If you fly somewhere to attend your son’s wedding, the trip is not deductible. But if the primary purpose of the trip was to attend a valuable 3-hour association meeting on Thursday night and visit colleagues on Friday and Monday, you are taking a business trip. It’s deductible even if you take a weekend break from your busy work schedule to attend the wedding. All deductible: airfare, lodging, car rental, meals – everything. Everything except that round of golf on Sunday. These rules for both business owners and employees. Keep a diary. The IRS adores “contemporaneous: recordkeeping. Write down where you go and what you do (for your business or career), and what you spend every day. 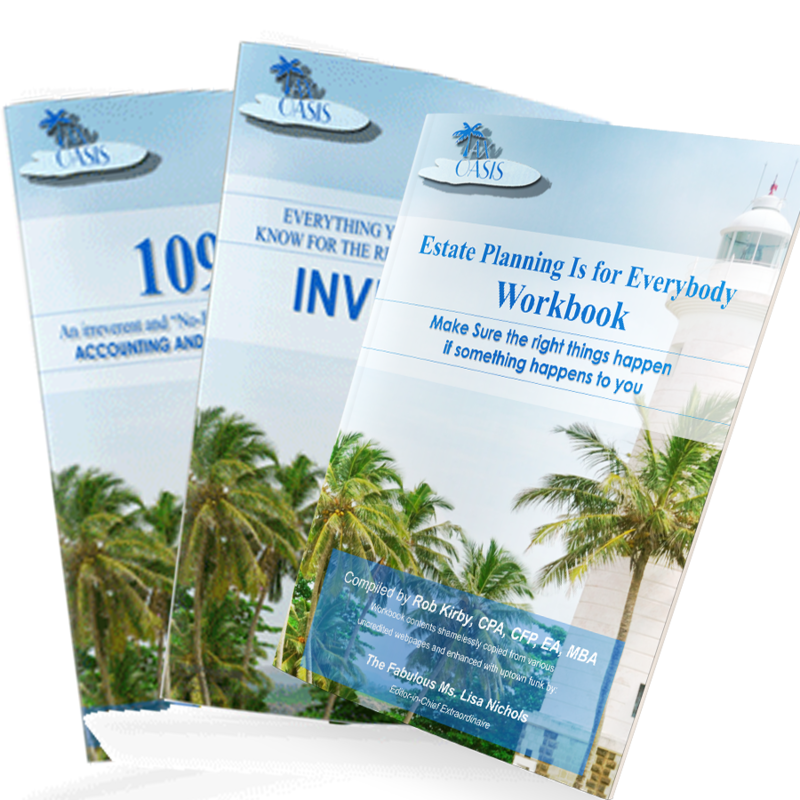 You will avoid overlooking any deductions and you will have all the evidence required to substantiate your ‘spin’. One of my clients sold a screenplay and used his diary to go back three years and document expenses directly involved in developing the story line. Build your own sorry line for your business or career that converts previously personal expenses into tax deductions. Black Mycoskie started Tom’s shoes with the promise of giving a pair of shoes to a child in need for every pair he sells. Given that story line, whenever Black hops a plane for anywhere, it’s a business trip f he packs a box of give-away shoes. What’s your story? Save stuff. Yes – all those receipts may be useful one day. Start a fresh box each year. To substantiate a tax deduction you need to prove two thigs: that you paid for it, and that it was an “ordinary and necessary” business expenses. Even if the expenditure appears on your credit card statement, you may need the actual receipt to identify the items purchased and prove that you bought was used in your business or career. Maintain good IRS hygiene. File on time, open IRS mail, respond promptly, and forgive the IRS in advance for everything they are going to do. (This practice is helpful with your weird cousin, too). You really do earn a participation grade with the IRS. There is a new IRS program called “first-time abatement” (FTA) – see the internal Revenue Manual section 20.1.1.3.6.1. This provision went into effect on 8-5-14. If you have filed all your returns on time for the last 3 years, and paid or arranged to pay (on a payment plan) your taxes, you automatically qualify for a penalty relief if the IRS disallows some of your metastory expenses. My parents always hoped I would be an entertainer on Broadway. I learned to sing and play several musical instruments. I won a scholarship to a private school for the arts, and I started by adult life playing woodwinds professionally in the Army Band. Even though I showed early evidence of an affinity for keeping records (scorekeeper on the baseball team, treasurer for the stamp club, etc. ), I pursued the musical path. But it never felt right. Not until a service-connected disability called a halt to my musical career. The VA sent me through vocational rehabilitation testing and told me I should be an accountant. At first I objected, but after my first class I was hooked. The VA paid for my MBA. I owe a great debt to the Army and the VA for righting my path. Now I give back the gift that I was given by dedicating my life to helping clients overcome their challenges and find their own melody, harmony, and rhythm. This entry was posted in Blog, CPA, Taxes and tagged business expenses, marketing on January 13, 2016 by c06578806.